It could be argued that this is the Filter Bubble in action… how likely is it, for example, that a randomly selected person on the street would have heard of this book? Take education, or research, for example. Sometimes, we want to get the right answer to a particular question. In times gone by, we might have asked a librarian for help, if not to such a particular book or reference source, at least to help us find one that might be appropriate for our needs. Nowadays, it’s often easier to turn to a web search engine than it is to find a librarian, but there are risks in doing that: after all, no-one really knows what secret sauce is used in the Google search ranking algorithm that determines which results get placed where in response to a particular search request. The results we get may be diverse in the sense that they are ranked in part by the behaviour of millions of other search engine users, but from that diversity do we just get – noise? As part of the web personalisation/search experiment, we found that for many people, the effects of changing personalisation settings had no noticeable effect on the first page of results returned for a search on the word “platform”. But for some people, there were differences… From my own experience of making dozens of technology (and Formula One!) related searches a day, the results I get back for those topics hen I’m logged in to Google are very different to when I have disabled the personalised reslults. As far as my job goes, I have a supercharged version of Google that is tuned to return particular sorts of results – code snippets, results from sources I trust, and so on. In certain respects, the filter bubble is akin to my own personal librarian. In this particular case, the filter bubble (I believe), works to my benefit. Indeed, I’ve even wondered before whether a “trained” Google account might actually be a valuable commodity: Could Librarians Be Influential Friends? And Who Owns Your Search Persona?. Being able to be an effective searcher requires several skills, including the phrasing of the search query itself, the ability to skim results and look for signals that suggest a result is reliable, and the ability to refine queries. (For a quick – and free – mini-course on how to improve your searching, check out the OU Library’s Safari course.) But I think it will increasingly rely on personalisation features…which means you need to have some idea about how the personalisation works in order to make the most of its benefits and mitigate the risks. As well as the content we discover through search engines, content discovered through social networks is becoming of increasing importance. Something I’ve been looking at for some time is the structure of social networks on Twitter, in part as a “self-reflection” tool to help us see where we might be situated in a professional social sense based on the people we follow and who follow us. Of course, this can sometimes lead to incestuous behaviour, where the only people talking about a subject are people who know each other. As far as diversity goes, if you follow people who only follow each other, then it might be that the only ideas you come across are ideas that keep getting recycled by the same few people… Or it might be the case that a highly connected group of people shows a well defined special interest group on a particular topic…. 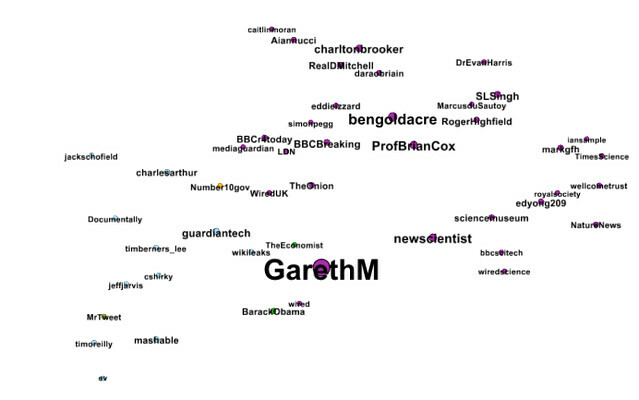 To get a feel for what we can learn about our own filter bubbles in Twitterspace, I had a quick look at Gareth Mitchell’s context (@garethm on Twitter). One of the dangers of using public apps is that anyone can do this sort of analysis of course, but the ethics around my using Gareth as a guinea pig in this example is maybe the topic of another programme…! 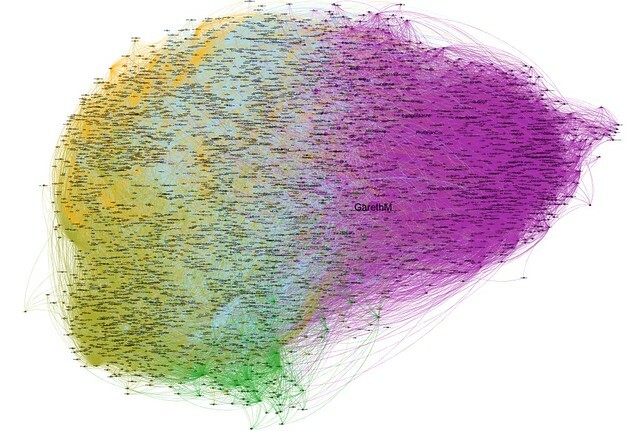 The nodes represent people Gareth follows, and they have been organised into coloured groups based on a social network analysis measure that tries to identify groups of tightly interconnected individuals. 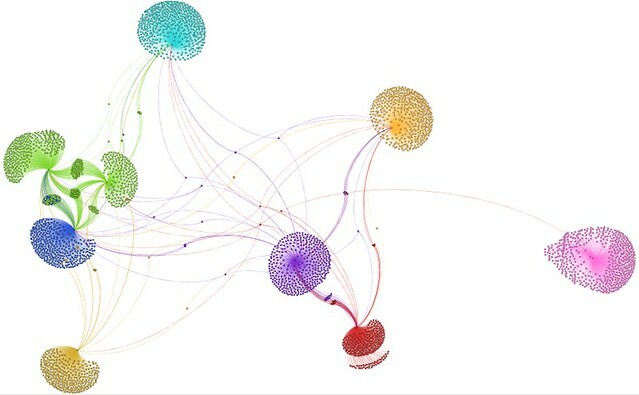 The nodes are sized according to a metric known as “Authority”, which reflects the extent to which people are followed by other members of the network. 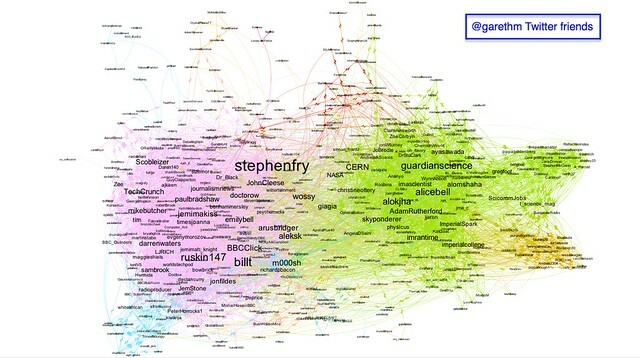 A crude first glance at the graph suggests a technology (purple) and science (fluorine-y yellowy green) cluster to me, but Gareth might be able to label those groups differently. The flowers are separate lists. 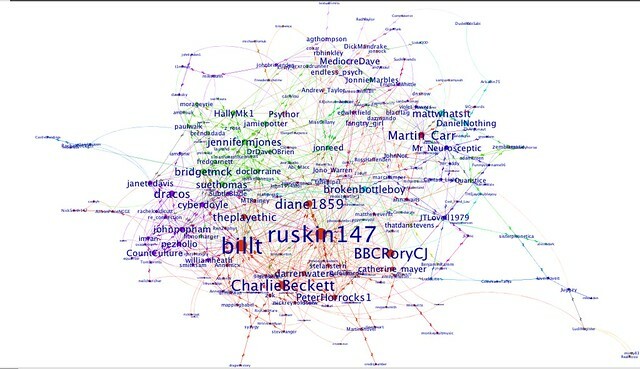 People who are on several lists are caught on the spiderweb threads connecting the list flowers… In a sense, the lists are filter bubbles defined by other people into which Gareth has been placed. To the left in the image above, we see there are a few lists that appear to share quite a few members: convergent filters?! For extended interviews and additional material relating to the OU/Click series on openness, make sure you visit Click (#bbcClickRadio) on OpenLearn. Did we miss a trick at dev8d? Should we revive the filter bubble experiment or has that ship sailed? Previous Previous post: Using GetTheData to Organise Your Data/API FAQs?